Perhaps I shouldn't have been digging through my hair, and perhaps in a perfect world I wouldn't have to deal with roots and coloring my hair. One way or another, it happened. A few weeks ago I found my first gray hair. Then I found another...and another...and way way too many more after that. It shouldn't be that big of a deal, the logical part of me knows this. Yet here I am, every day, digging through my hair like some crazed maniac. Last night I found the mother load too. Right above both of my temples laid a gaggle...yes a gaggle of thin white hairs. So like anyone who isn't at all in their right mind, I stood there and tried to pluck them out. As if somehow I could wish hard enough for them to not come back. I know I can color my hair, already do color my hair. Heck, I don't really know what my true hair color is seeing as I have colored it since high school. This would be the logical side trying to fight back to regain control. Crazy maniac side won't have it, because no matter how much I color my hair...those grays will be growing longer and more plentiful under the color. Why does this bother me so much? Is it vanity? Is it the fact that I'm not 30 yet? I knew this was coming. My mom's side went gray early. So early that part of me is shocked that I made it this long. Yet here I sit...wanting to run to the bathroom to see how many more I can find. 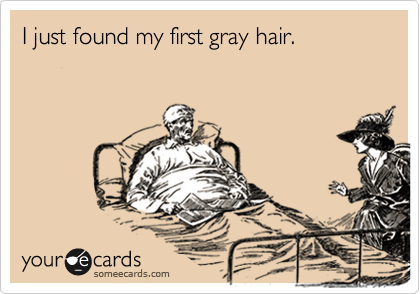 I get that my gray hairs aren't going to magically turn me into some new or different person. Yet it still just has a way of making me feel old, as cliche as that is. And with so many other things in my life making me feel old, I just didn't want or need this extra thing. I feel like I should go drink, dance on bars and stay out till 3am to compensate. But that was who I was 6 years and a handful of grays ago. Instead I will go out, buy a box of hair color or two, do everything in my power to not look for more grays and go to be no later than 11pm. So glad you found me! Welcome, I hope you like it here! I went through this. I found my first grays at 24. Now at 33, there are a lot more of them. I try not to look; I just color and ignore. If I look, I get instantly depressed. I like to imagine that in 20 years or so, I'll embrace them, but I'm not taking any bets! I'm working on the color and ignore part. If only I didn't have to separate my hair to apply color, cause that's when I really find them! Here's to 20 years where we can test your embracing theory! Even if your friend doesn't feel your pain, I do! It's something so small and silly, but enough to mess with you. And yes, dang it, we are young and fabulous!